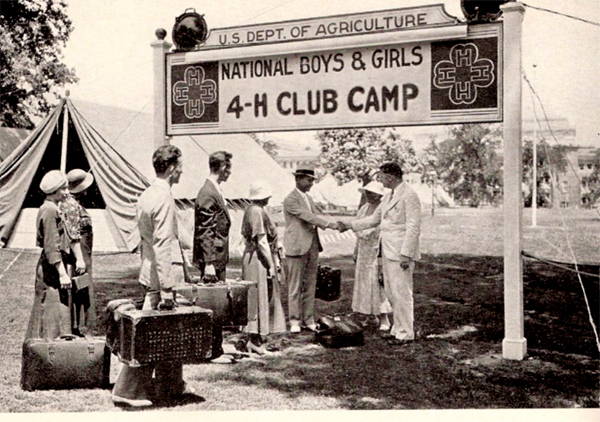 National 4-H Camp Comes to D.C.
National 4-H Camp, an annual event since 1927, was held in Washington, DC 26 times before being replaced by National 4-H Conference in 1957; no 4-H Camps held during World War II. For those 26 years, National 4-H Camp made an indelible impression on the countless youth who participated in the event and experienced the speeches by national leaders, field trips to nationally significant sites, and camaraderie among participants that made it a much anticipated yearly tradition by 4-H members and leaders from around the country. The sitting Presidents and First Ladies often visited the camp site and talked with the delegates or 4-H’ers visited the President at the White House. 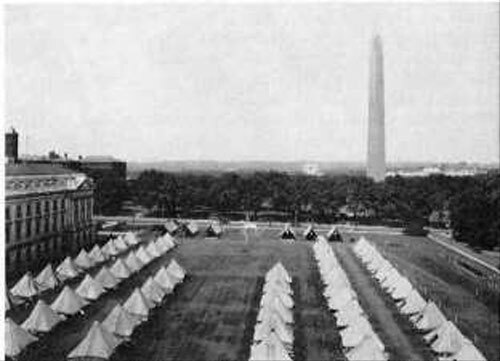 The annual “tent city” of the 4-H’ers on the National Mall, next to the USDA Administration building and in the shadow of the Washington Monument, could not help but be noticed by Washington, DC residents and visitors, alike, including the Representatives and Senators. It was most definitely a high visibility event.